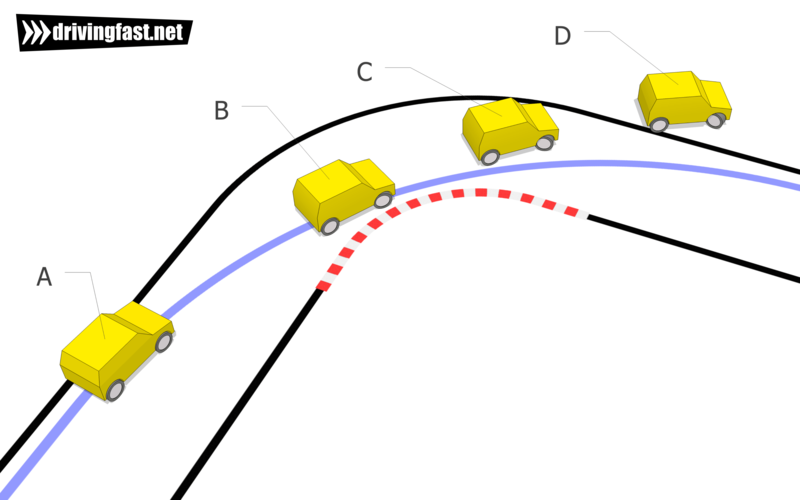 Understeer occurs when traction is lost at the front wheels while cornering, forcing you wide on a bend despite applying the correct steering angle (Diagram 1). When viewed by an observer, this action looks as if the driver has applied insufficient steering lock (or under steered). If you’re car is understeering, you’re scrubbing off speed and missing the optimum line, so it’s not a quick way to take a bend. Let’s start by taking a look at four stages of understeer. Having lost traction, understeer is actually a fairly stable state for the car to be in, and thus many manufacturers ‘engineer in’ this behaviour. Picture the scene, you’re in a front wheel drive car on a roundabout about to take the third exit but you think it might be a laugh to go round again. You keep accelerating through the bend and find that the car has a tendency to run wider and wider. The available grip at the front wheels is being used in equal amounts to accelerate and to steer. As you accelerate more, you have less grip to steer – simple. So, reducing either of these inputs will correct the understeer. This is the easiest form of understeer to correct, and a slight, smooth reduction in power will free up more grip (with the added benefit of a forward weight transfer), and a small corrective input to the steering will get you back on line. In a rear wheel drive car, in theory the front wheels will be able to resist understeer for longer due to the division of steering and drive between the front and back wheels. However, understeer can also be engineered into a car for safety, and most rear wheel drive cars will also understeer if power is progressively applied mid corner. If you do decide to accelerate aggressively mid corner you’re likely to cause oversteer. When you apply the brakes, most of the braking effort is exerted on the front wheels due to the forward weight transfer. So if you’re braking into the corner you’re already using most of your available grip trying to scrub off speed. If you then apply some steering lock, the addition of these lateral forces on the tyre can cause the limits of grip to be exceeded. 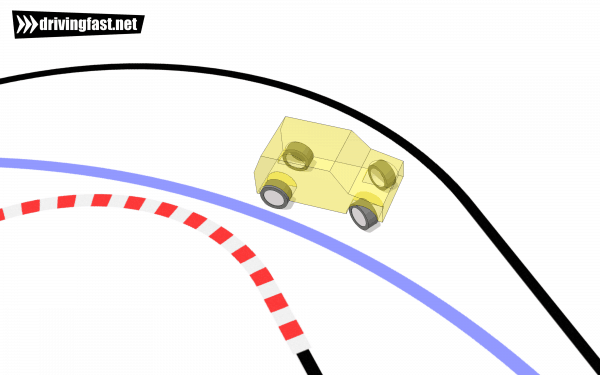 So, correcting understeer seems simple – stop trying to turn the corner (a better plan might be to get your braking out of the way while you’re in a straight line). However, if you happen to be in the middle of a bend as your car starts to understeer, continuing straight on might not seem like the best plan. An alternative strategy could be to reduce your braking effort, freeing up more grip for steering and hopefully allowing you to take the bend successfully. If you have attempted to take a corner too fast, have turned the steering wheel, and find yourself running wide, you my friend are in a spot of bother. But before you close your eyes and hope for the best, all may not be lost. You’ve exceeded all of the available grip, yes, but it may be possible to actually increase the level of grip by the slightest, smoothest dab on the brakes. “The brakes? !”, I hear you shout, “but surely that is adding to the demands of the tyres, not reducing them?”. This is very true, but if you’re not totally out of control by pressing the brakes you’re causing the weight to transfer to the front, and thus artificially increasing the levels of adhesion at the wheels. This may, however, not work. The moral is to enter the corner at a slower speed, then get on the power early on the way out. If you’ve entered a corner at speed and notice a sudden reduction in traction due to oil, black ice or a banana skin, the best course of action (in the immortal words of Douglas Adams) is to consider how lucky you are that life has been kind to you so far. If life hasn’t been kind to you, consider how lucky you are that it won’t be bothering you much longer. Alternatively, be careful, think about the conditions and adjust your entry speed accordingly. In some situations on the track, it may be possible to get a better time by leaving your braking to the very last minute, forcing you to maintain braking into the turn. If this is the case, ensure most of the braking effort has been carried out in a straight line, and progressively release the brakes as you approach the apex. The resulting forward weight transfer can reduce understeer and improve ‘turn in’, however, it can also make the car more prone to oversteer. This is an advanced technique and should only be used once you are very confident with your car, the track and the conditions. Might be worth consulting an expert before doing anything too dramatic, but if you’re feeling adventurous, the chart below can help. 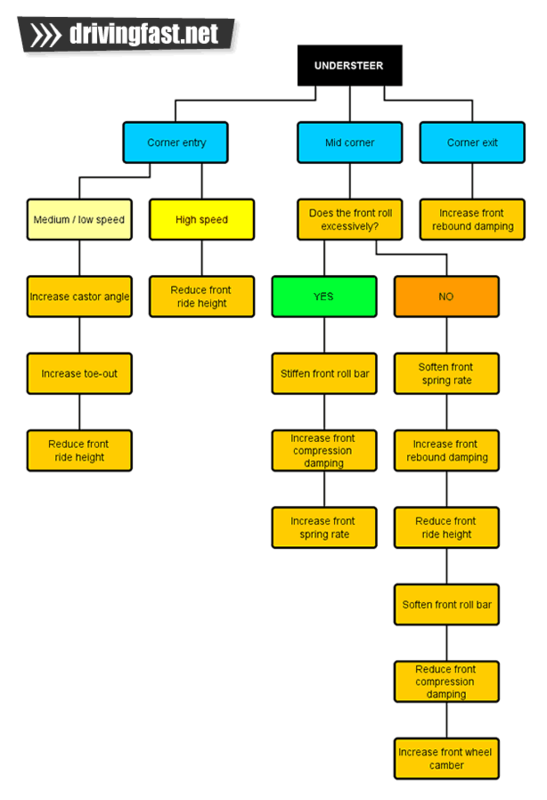 Below is a flowchart which can help diagnose and treat the symptoms of understeer. Credit to ‘Competition Car Suspension’ by Greg Simmons for the original image Disclaimer: Always stick to the manufacturer’s recommended limits when altering tyre pressures, and never modify a road car. Oversteer is related to understeer and occurs when the rear tyres reach the limit of adhesion in a corner before the front while cornering. Learn how to control it here.